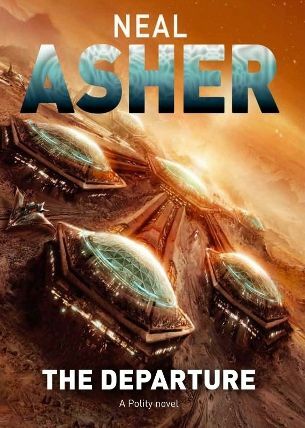 It’s all change for space opera veteran Neal Asher – for the first time since his 2004 standalone novel Cowl , he’s delivered a story that isn’t set in the Polity, his vividly-realised future civilisation. There’s even an absence of his familiar hallmark of horribly imaginative alien creatures. Instead, The Departure kicks off the Owner series in a bleaker and not always entirely successful style. Initially playing like a turbo-charged mix of Total Recall and The Bourne Identity , The Departure moves at Asher’s usual bullet-speed pace, while giving us a brisk tour of an uncomfortably dark and Orwellian future world. However, while the action setpieces and gory violence are as expansive and vivid as anyone could want, Asher’s Bond-goes-SF storytelling doesn’t feel quite so fresh or inventive here. This is mainly down to the flat characterisation, which lacks depth and goes for stock heroics and villainy. It’s a disappointment after the brilliant characterisation work on Asher’s previous novel The Technician , and makes it hard to invest in Saul’s quest for vengeance beyond the excitement of the full-tilt action sequences. Despite these problems, The Departure still delivers plenty of thrills, and the climax also sets up a very intriguing status quo for the second volume. It’s just a pity Asher gets distracted by putting all the pieces in place for the rest of the Owner saga, meaning this opening book ends up feeling too much like a warm-up act rather than the main attraction.